St. Peter’s Basilica is subject to last minute closures for religious ceremonies. When this occurs, we are happy to offer customers an extended tour of the Vatican Museums. We strive to tell tour groups ahead of time to plan accordingly, but if there are any planned disruptions to St. Peter’s Basilica opening hours this is not always possible and in these cases we are unable to provide refunds or discounts. Strict dress-code; shoulders and knees must be covered. Visitors are required to check-in bags, tripods, backpacks or bulky luggage. We strongly suggest you leave large items behind because checking in these items at the museum will result in delays. Also be advised that there is a security point before the museum with a metal detector and X-ray machine for your personal items, so kindly leave sharp items behind as they will not permit you entrance with them. Please note that on Wednesday mornings St. Peter's Basilica may not be open due to the Papal Audience. If you wish to visit St. Peter’s Basilica please choose the 10.30 am or the 1.30 pm tour on Wednesday to take advantage of the full tour. Around Rome Tours is a tour operator licensed by the Province of Rome, with headquarters on Via Vicenza 42 - 00185 Rome. It is accredited by the Vatican Museums, and therefore benefits from priority VIP entrance tickets so guests of tours do not have to wait in the long lines to enter the Museums. This private tour of the Vatican Museums will include the Museums, the Sistine Chapel, St. Peter’s Basilica and St. Peter’s Square. With your personal guide you will visit the best collections of art on display in the Vatican Museums, home to one of the largest art collections in the world. The Private Tour of the Vatican will begin using our fast track, skip-the-line tickets so our guests will not have to wait in the two hour long lines before entering the museums. Our guides have the highest knowledge and experience to offer you the finest service and are available to answer all of your questions. Once inside the Vatican Museums on this Private Tour inside the walls we will cross the Pigna Courtyard, which takes its name from the gigantic bronze pinecone placed in the middle, a work found at the Roman Baths of Agrippa(should we have this part in?). There is a part between these two…. You are then lead to the Gallery of Maps, a 120 metre long tunnel that includes a set of all the maps that represent the unification of Italy, both geographically and spiritually. Then on to the Gallery of Tapestries which is filled with tapestries that were woven in Brussels by the manufacturer Pieter van Aelst and represent the most significant religious events. Next you will be taken through the Museo Pio Clementino, which houses some of the most important collections of sculptures from the Greek-Roman world. The sarcophagus of Lucius Cornelius Scipio Africanus Barbaro, the Apollo Belvedere, the Laocoon Statue of Hermes, the statue of Venus Felix, the Perseus triumphant and Kreugas and Damoxenos, all important historical pieces that are housed right in the Vatican Museums. Finally the Vatican Museums Private Tour will lead you into the Sistine Chapel, which is a cultural and artistic treasure of the Vatican City. It’s known throughout the world for the conclave and other official ceremonies involving the Pope. 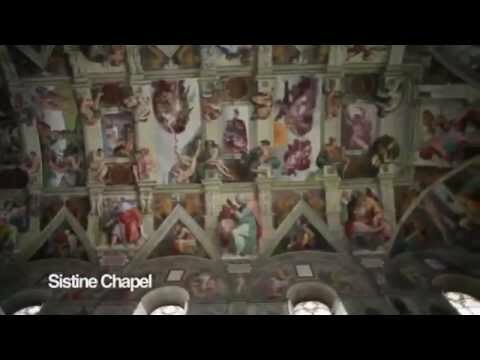 The entire Sistine Chapel is a message of universal faith. The frescoes of Michelangelo Buonarroti, the "Last Judgement," is a unique work where the artistic genius of Michelangelo is expressed in all its majesty with a vision of the end of the world and the dramatic scene of man's destiny. After the Sistine Chapel you will stroll through St. Peter's Basilica with your guide where you will see the dome of Michelangelo, Bernini's canopy, the bronze statue of St. Peter by Arnolfo di Cambio, the tomb of Blessed John Paul II (Karol Józef Wojtyla), the Pietà by Michelangelo plus more. The Vatican Museums Private Tour will end finish in Peter's Square, with its majestic colonnade designed by Bernini, a masterpiece of art and technique. Your guide will show you the best vantage point to view the square – a finish to the tour that makes everything come together. For those of you wishing to visit the Vatican Museums VIP style and with the luxury of your own private guide look no further than this Vatican Museums Private Tour, a must do on your trip to Rome. Very profesional guide with high level of historical education.rnInitialy requested in french the guide switch to english without any difficultiesrnThank you again Dina for these nice time in Vatican. Dina è una guida fantastica, lo staff è stato particolarmente disponibile con noi. Un\'esperienza da ripetere. Tour fantastico, Dina, la nostra guida, è preparatissima. Lo staff è stato straordinario nel consigliarci e nel seguirci passo passo in fase di prenotazione. Raccomandiamo vivamente questa compagnia. Splendito tour del Vaticano. Staff gentilissimo e guida molto preparata. La nostra guida, Irene, è stata talmente brava che non ci siamo nemmeno resi conto del tempo che passava, tre ore sono letteralmnete volate! Consiglio vivamente questa compagnia. Dina was very informative and friendly! We have a great idea booking this tour, cause we could enjoy everithing in the details! For the quality of the tour I can say it\'s not so expensive and it is worthy! C\'était super! J\'ai tout bien vu et la guide était excellente! Merci! Absolutamente de primera clase!Una excursión inmensamente agradable del Vaticano con nuestra guía experta y encantadora! Die Tour war fantastisch. Die Guide, Ilona, war sehr kompetent und als nur mich, meine Frau und meine beiden Kinder, es gab nicht Verwirrung. Wirklich vielen Dank! Esto tour privado del Vaticano fue una experiencia ÚNICA!!!! Ottimo rapporto qualità - prezzo. Staff disponibilissimo. Irene, la guida, ci ha fatto trascorrere tre ore piacevolissime. Entre varias opciones la mejor de Roma! Amazing experience.. staff are very friendly and knowledgeable. Hicimos una excursión por el Vaticano hoy con Luisa y nos lo pasamos de maravilla. El Gran Tour de relación calidad-precio y recomiendo la compañía. It was one of the tours that we have done around the world. Tanck you. We made the Private Tour and it was a great idea. We loved the way that Sabrina explaned to us everything inside of the Museums and the Basilica. Very nice tour. Amazing Tour with an amazing guide... I have already recommended this to all of my friends! This tour was the best way to see Vatican Museum and St Peter's Basilica. Irene was an excellent guide ,very knowledgeable and interesting. We found out so much about the paintings and the buildings we saw. Great tour! Fabulous! A very informative and very enjoyable tour. Plus Irene was great! She did a great job customizing our tour to the interests of our group. Thanks! The tour guide was brilliant. Enthusiastic, amazing and very knowledgeable. A fantastic tour. This tour was great. We booked a private tour just for the 5 of us so it was very easy to interact with the guide and see the displays. Irene was great with a good balance of humor and information. Thanks for a very enjoyable tour. The four of us in my family were the only ones on the excursion. The individual attention was fantastic! My friends and I recommend this tour, if you can make it private because it worth it! Great Tour, we enjoy and learn a lot inside the museums. An excellent guide, informative without being boring,knowledgeable and witty… Will have no problem in recommending this tour to anyone. The last booked tour: 16 minutes ago, from Spain. There are currently 10 other people viewing this page.